Summary : If you like orange flavored teas, you will like this tea. The orange flavor is a bit on the weak side, at least for me. I was hoping for a "bit more pop" in the orange flavor cateogory, but overall, I had no complaints. Review : Orange is such a "happy color," don't you think. I like the color orange that I even created this website using orange. And well, if you don't like the color, too bad for you...since you don't know what you are missing. Orange is great. And this applies to oranges too...you know...those things that grow on trees in Florida and California and form the basis of my favorite breakfast drink. Since I truly love "all things oranges," I will basically give anything that is "orange" a try. Well, maybe not everything, I might pass on the opportunity to try out orange drugs, if there is such a thing. But beyond that, you say orange, and I'll be there. And so it was I found myself one night poking through my recent and rather large order of sampler teas I ordered from Dragonwater Tea Company (now out of business). As it happens, the first thing out of the box was, you guessed it, a orange flavored Rooibos Tea...so off I went to give this tea a try. 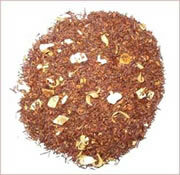 If you are not familiar with Rooibos Tea, the leaves for this tea are grown in South Africa, and thus are not technically considered "tea leaves." Well, who cares really. What counts is the taste, right? One thing I like about the sampler packs that Dragonwater Tea Company (now out of business) packs up their samplers in is that you can see the tea, as part of the package is clear plastic. Technically speaking, perhaps this is not such a good thing, as tea shouldn't be exposed to light that long. But, short of storing the tea underneath a fluroscent lamp or out in the sun, simply tossing the samplers in your kitchen cupboard solves that problem. But of course, the benefit of the see-through packages is that you can see what you are about to try...before opening up the bag. This is rather nice. Because of this, I suspected I was going to like this tea long before I opened up the package...simply because I saw orange pieces all over the place. The aroma of this tea straight out of the bag is powerful. Indeed, you get a whiff of the teas fragrance before the bag is fully opened. And, better news still, the tea had a aroma of orange...always a good sign in a orange flavored tea. So off I went to brew this tea, letting it steep for 9 minutes. So what did the tea taste like? Well...how about oranges for starters? Admittedly, I was hoping for a bet strong orange taste, but that was probably due as much to my experience with Adagio Teas Orange Rooibos Tea which comes about as close to tasting like an orange as you are likely to find. Still, there was no mistaking the fact that this tea did indeed taste like oranges. A bit subdued perhaps, but far overpowering the bagged teas of the world. Equally important, this tea simply glides down simply and effortlessly. You'll find no bitterness here. And lastly, there is the after-taste. Considering the rather subdued nature of the orange flavor in this tea, I wasn't expecting a huge after-taste. Well...I was wrong. You really do get a nice, lingering orange flavored after-taste with this tea. Recommendation : Yes. This tea has a nice, rather subdued orange taste to it. It's isn't quite as strong, flavor wise, as Adagios Orange Rooibos Tea, but it is quite good none-the-less. Basically, if you want a strong orange taste, go with Adagio's offering. For a more subdued taste, where you get more rooibos tea flavor, I would try this tea instead.